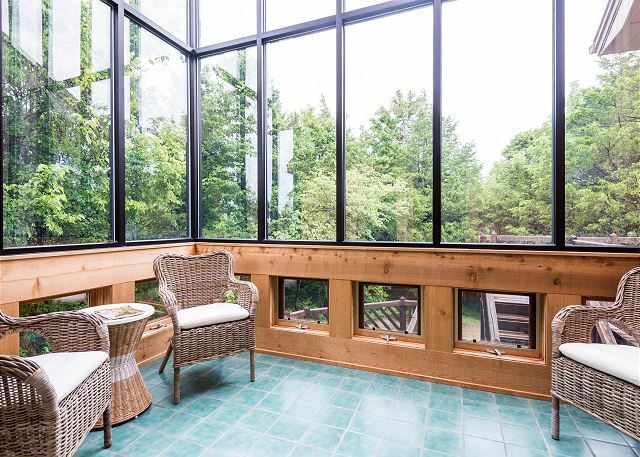 Blackberry Hill is your private Bluegrass country retreat! 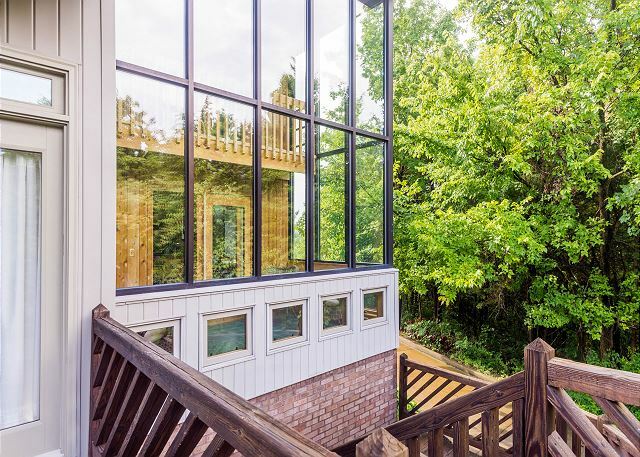 This contemporary home is set on a very private, wooded 10 acre lot in the historic town of Harrodsburg. With lots of windows and a unique hilltop setting, the home’s main level lives almost like a treehouse. It is incredibly peaceful! 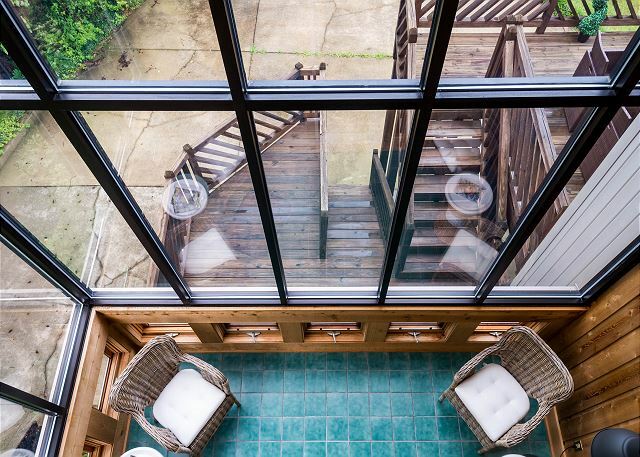 A large back deck is equipped with an outdoor dining area and a charcoal grill is supplied for cookouts. 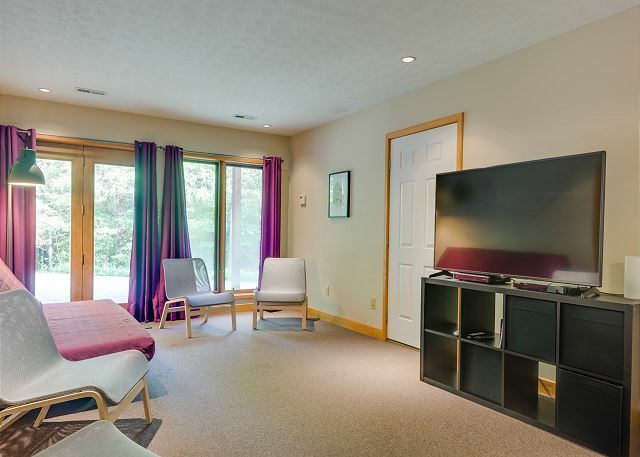 Four bedrooms (3 King and 1 Queen) and a large finished basement with two Queen size futons accommodate up to 12 guests comfortably. The home was recently purchased in 2016 and all furniture and bedding is brand new and super comfortable. A 3 car garage plus plenty of driveway space can accommodate parking for RVs and trailers if you have them! Blackberry Hill is the perfect home base for visits to Lexington and surrounding Bluegrass attractions from National Register Historic Districts to the Bourbon Trail! Harrodsburg itself is the oldest town in Kentucky and one of the most interesting historic towns in America. Old Fort Harrod State Park features a full scale replica of the first permanent settlement west of the Allegheny mountains. Ten bourbon distilleries and a dozen wineries are within short drive and the darling Beaumont Inn is the best place around to get authentic Kentucky cuisine (the corn pudding is famous and the restaurant was a 2015 James Beard Foundation “America’s Classics” award winner!). Shaker Village of Pleasant Hill, one of BBC News Magazine’s “Five US Hidden Travel Destinations” is 12 miles from the house and the historic towns of Perryville, Danville and Bardstown are all a short drive. Keeneland and Bluegrass Airport in Lexington are about a 40 minute drive and you can be to UK and downtown Lexington in under an hour. Louisville and Churchill Downs are within striking distance as well - just under an hour and a half drive! 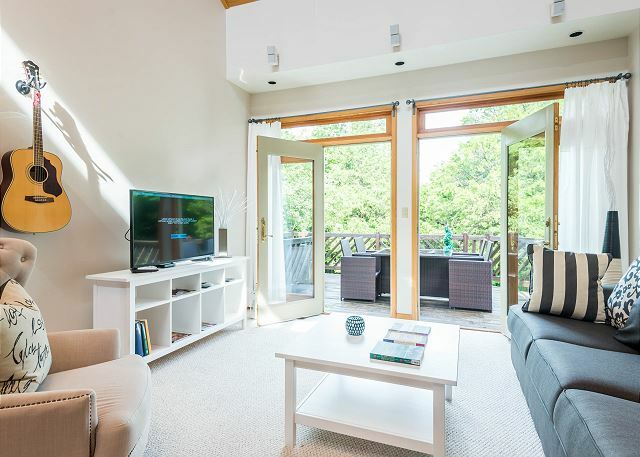 As with all rentals from The Holiday Life, the home comes stocked with high quality linens, a fully equipped kitchen, WiFi and HDTVs. This home has DirecTV satellite service. Thank you, Amy! Sounds like you ladies had a wonderful trip. We will definitely consider putting another fridge somewhere in the home, thank you for the suggestion! Hope to host you again in the future! This is one of the nicest houses I have stayed at through home away. The house was clean and spacious. The kitchen was much better stocked than some, with adequate hand and dishwasher soap, spices, and aluminum foil for our stay - those little things make such a nice difference. The house was exactly as described. Check in/out were very simple and easy. There were comfy couches and a nice gathering space at the center of the house. We will definitely stay again when we're in the area. Thank you so much, Katherine! It means everything to us that you appreciate the little things like spices and dish soap! 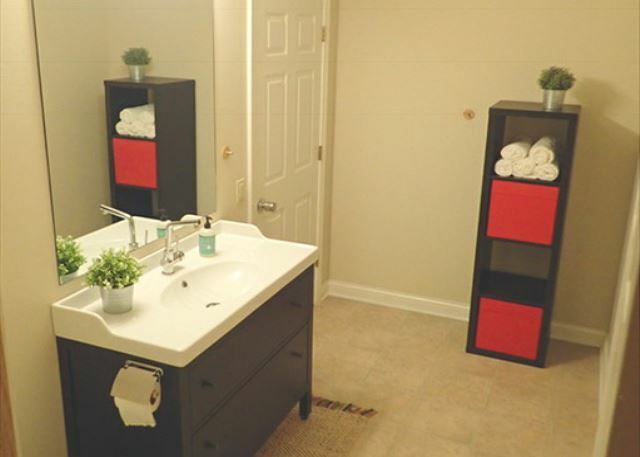 We strive to keep our properties at a "move in ready" level at all times! We would love the opportunity to host you again in the future. We spent a lovely long weekend at Blackberry Hill. The house is spacious and well-appointed, and comfortably accommodated a group of 12 adults. The house is lovely and the location was perfect -- a private, country setting, yet close enough to shopping, dining, and other necessities. We thoroughly enjoyed it. Thank you, Amy! Blackberry Hill is certainly spacious enough for larger groups, we're so glad you had plenty of room! Sounds like you took full advantage of everything Lexington has to offer! We would love to host you again in the future! Thank you, Peter! 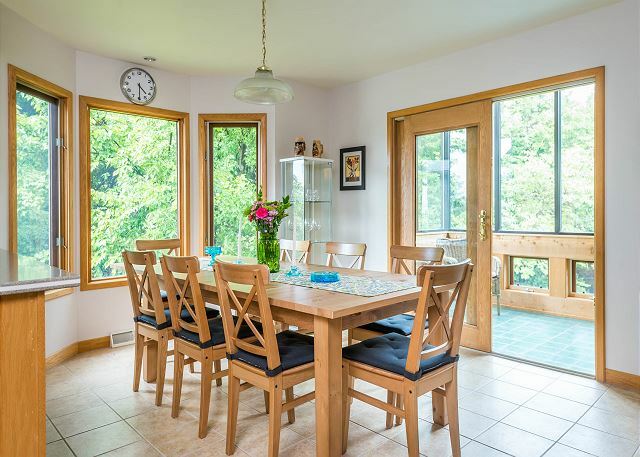 Blackberry Hill is extremely spacious and perfect for larger parties. We're glad you had a wonderful vacation in Lexington! See you next time! This is the second year we rented this property. It still was maintained beautifully. Having the large garage to keep the vehicles in is a plus. We had a Ford Raptor & a mid-size car in the garage. Still had room to walk around the vehicles. Thank you, Rebecca! Blackberry Hill is extremely spacious and perfect for larger groups. We're so thrilled that you had a wonderful time in Lexington! See you next time! We stayed at Blackberry Hill in order to visit some of the distilleries on the Bourbon Trail. It was in a perfect location, was clean, comfortable, beautifully decorated, and we could not have chosen a better vacation home. Thank you SO much!!! Thank you, Kim! 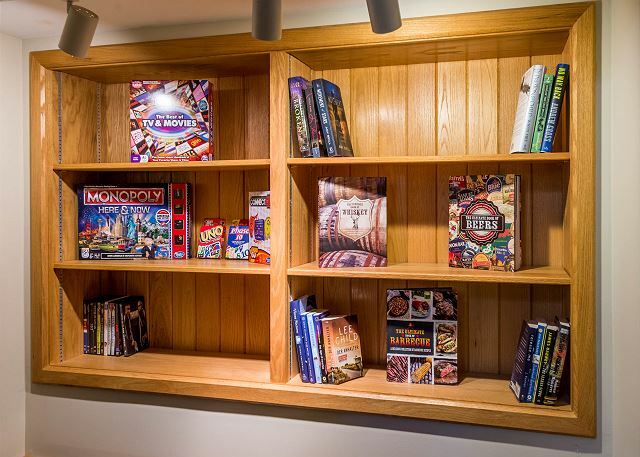 We're so glad Blackberry Hill fit all of your vacation needs. Sounds like you had a wonderful time in Lexington! See you next time! We rented the home for our extended family to come together for a wedding just 4 miles down the road. Blackberry Hill was absolutely perfect. 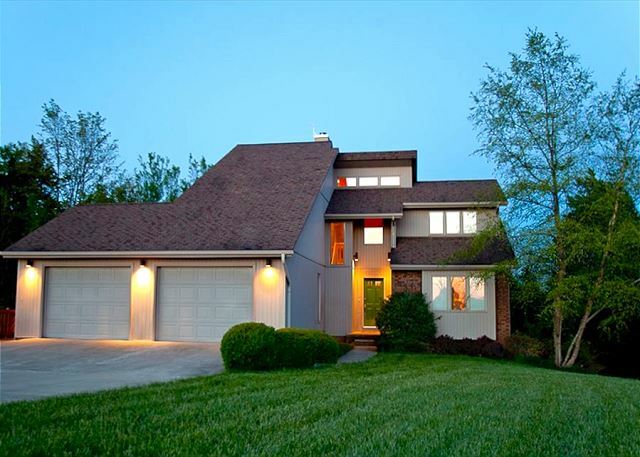 It is a beautiful contemporary home with plenty of room for our various family members to have their privacy or join together for "hang-out" time between festivities. The setting is rural on a quiet country road suitable for walking or running but easily accessible from the highway. The well-equipped kitchen and dining area is spacious and comfortably seated the 12 of us. I can't say enough nice things about this property or the very responsive management. Our family is still talking about what a great time we all had at Blackberry Hill. Thank you, Nancy! Wow! 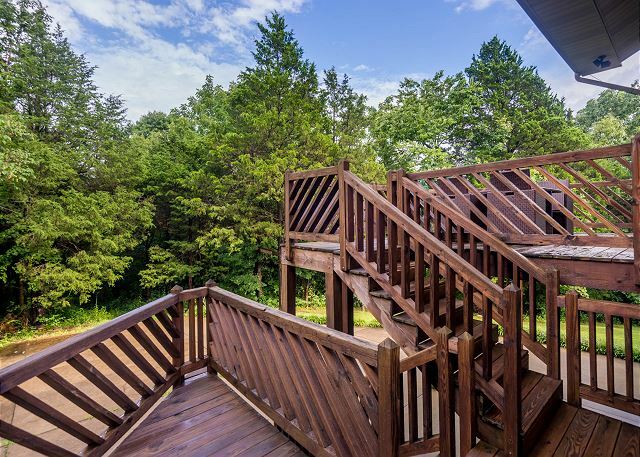 We're thrilled that Blackberry Hill could host your whole family for a great vacation! We would love the opportunity to host you again next time you are in the Lexington area! Very well appointed 4 bedroom plus home in a lovely little town. Very spacious and comfortable. The only issue we encountered was a storm had apparently knocked out our television service, but we had plenty to do without television, and we could all probably lose the tv for a few days. The management credited us an amount to compensate for that loss. If ever I stay in that area again, I will see if Blackberry Hill is available first. Thank you, Michael! I'm so sorry for the TV being out but very glad that you were able to explore all of the exciting things Lexington has to offer! There is always something to do in this city. We look forward to hosting you again in the future! We had rented the house so we could be together as a family and go to a wedding in Frankfort. We really enjoyed our stay. The only downside was phone reception was not the best and when we finally tried the TV we could not get it to connect. We called because we found the keys, but no garage door clickers only to be told that there were no clickers so you might want to take that off your list. Also found it odd the windows weren't locked when we arrived. We had a fun surprise one morning when we looked out the window and saw a herd of goats in the driveway! The little boys had a great time watching them. We were very pleased with the number of dishes, pots and pans, utensils and amenities. A GREAT place to stay!!! We were traveling with a group of friends. This house was extremely clean and well stocked with the essentials. It was on a private setting and was within an hour of most of the distilleries and golf. We cooked most of our meals at the house and it allowed ample space for the 10 of us. If ever visiting this area again, would definitely check out this property. Thank you, Jackie! We're so happy you had a great time at Blackberry Hill. We would love to host you again! See you next time! We will be going back to stay at "Blackberry Hill"
My family and I was very impressed with our stay at Blackberry Hill. The rooms were big and beds were very comfortable. I can honestly say this has been the first vacation rental that we have stayed at that was very clean and spotless. Everything was nice and if I had any questions, they were right on it. Thank you so much. We will be back. Thank you, Martha! We put a great deal of time and effort into our turn-arounds so it is always nice to be complimented on our cleanliness! :) We can't wait to host you next time you're in Lexington or Naples, FL! We really enjoyed our stay at Blackberry Hill. The house was perfect to accommodate our group of 6. We stayed at Blackberry Hill for a bourbon tour trip and found that we could access most of the distilleries within 30-45 minutes. Sounds like you had a wonderful vacation, Terry! We're thrilled that you had a great stay at Blackberry Hill and were able to access the attractions easily! See you next time! The house was great for 3/4 couples. Large enough to accommodate all of us with a well stocked kitchen. A little sad that we did not have an out door fire pit, was really looking forward to spending some time outdoors around a fire. Our daughter is in a nearby college and it was her birthday weekend, so we brought the whole family to stay. An absolutely wonderful home and a huge surprise really. You are out in the country and suddenly turn the corner to find this wonderful home. It really had the feel of a mountain home retreat. It rained all weekend, but that didn't matter. Wonderful place to stay. I rented this house for a small family reunion and our annual Route 127 yard sale base for my cousins. This home was by far the nicest rental we have used in the last 10 years. Typically there are 6 to 8 of us to get ready in the morning and three bathrooms were ideal. The photographs do not do the home justice. We all commented about the cleanliness of the home and the basic supplies that were provided. Such a nice touch. We only called the rental company one time and that was about what was needed to be completed for checkout. They were very prompt in their reply. We would use this property again and would highly recommend it. Home rented for family reunion for 9 people visiting together from different locations throughout the USA. The home was spacious and comfortable for our group. Bedrooms with queen or king beds was a plus since we were a group of adults. Very relaxing and private location. Dining table large enough for all of us to eat together. This house was perfect for our stay. OUTSTANDING! Very peaceful. Easily accessible. Worked great for elderly father needing everything on one level. Located centrally for visits to local sites, events, and tours. We rented the BlackBerry Hill home in Harrodsburg, KY in June, 2017. 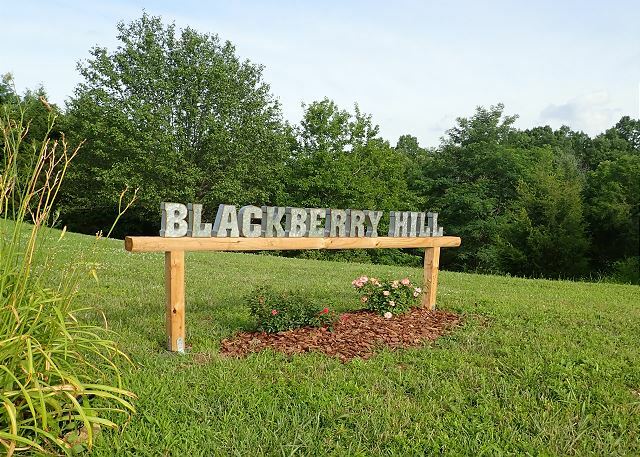 Our son's wedding took place at a church in Harrodsburg, and we found Blackberry Hill to be the perfect "home" for our family during all the pre-wedding festivities. It's a bit out in the country, but a beautiful little drive, and really not far at all from just feels like you're out! 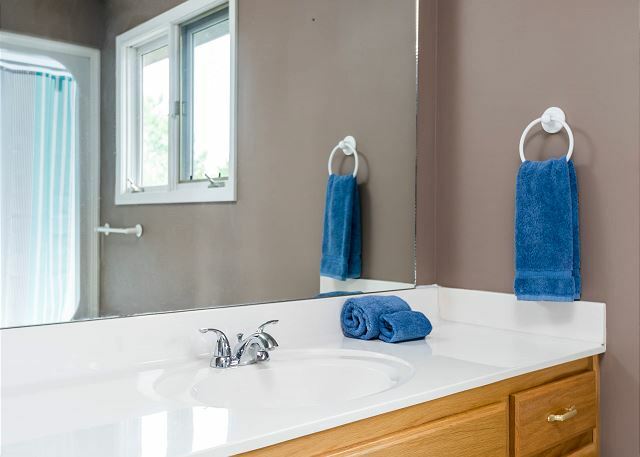 The home was incredibly clean, and had everything you could imagine needing upon arrival. 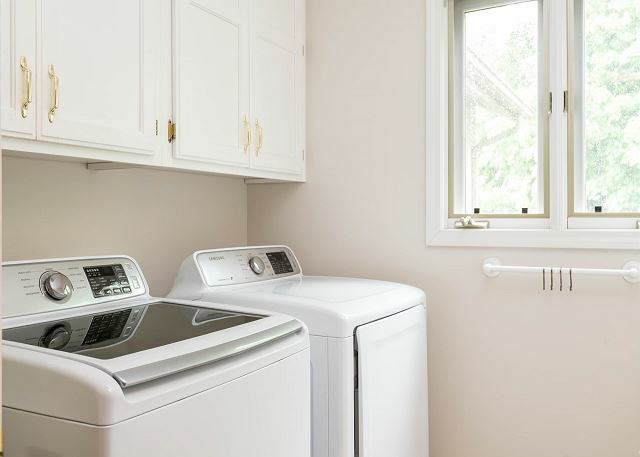 Soap, toilet paper, laundry detergent, and even many pantry items to get your vacation started without having to run to the store the minute you arrive. The pictures give an accurate glimpse into what you'll be getting, but simply do not do it justice. We had plenty of room for all of us. It definitely sleeps 12 comfortably. Plenty of parking space for additional cars as well. We didn't venture down the "hiking trail" behind the house, but if we had more time, we would have loved to explore. I was so happy to work with the Holiday Life on this rental, and look forward to another visit someday. VRBO is the Way To Go! This is my first experience using a VRBO. The place went beyond our expectations. It was even better in life vs the pictures. From Q-tips to spices to a French Press everything was available. I only wish we could have stayed longer. Great location to ride motorcycles out to numerous Bourbon Trail Distilleries. Large, spacious garage and parking area. Home was open and airy. Very nice, quite area. Very relaxing stay with two other couples at the blackberry hill house. Enjoyed the sites in the area, horse racing, bourbon tours, and many fabulous restaurants. Wonderful location and home to share with friends. Awesome, secluded and perfect for our group of 10.